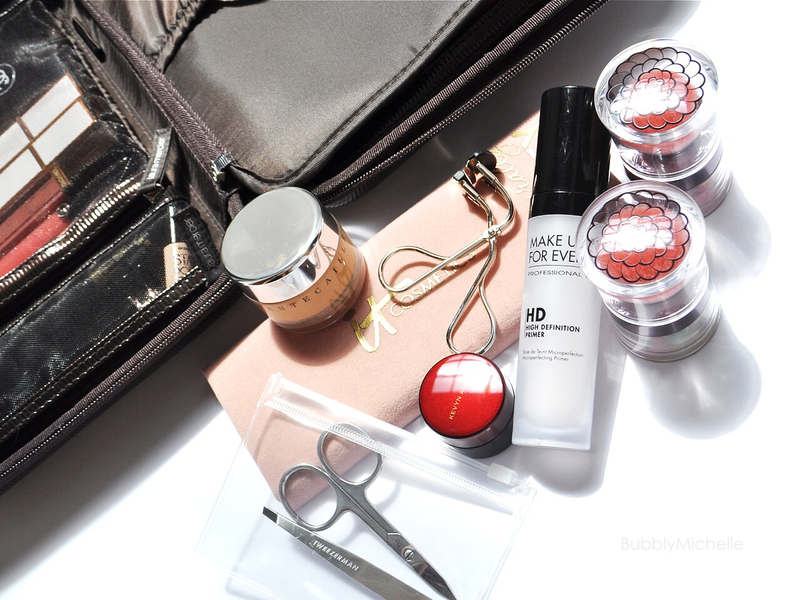 January 5, 2015 August 1, 2015 by Bubbly Michelle11 Comments on What’s in my makeup bag? How’s the beginning of the year been treating you so far? Good I hope! In my case, the start of the year has been somewhat busy and I have just returned back to the city from a week long stay at the beach. 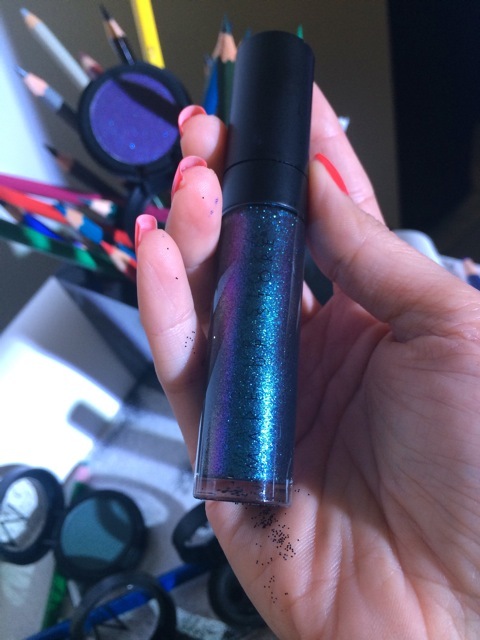 So today I dumped out the contents of my makeup bag so I can share with you a couple of things that have been proving quite useful while I was away! As you can see i’ve changed my makeup bag, yet again. This time I swapped it for a very light weight, black Ferragamo version which basically was free. It’s the Qatar airways travel pouch from my last trip. 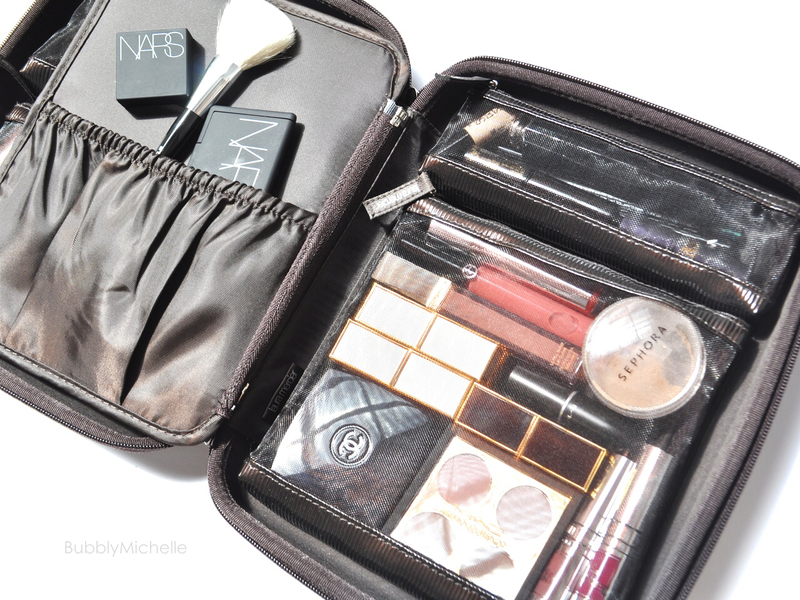 The case can be wiped clean and is pretty sturdy and most of all it’s the lightest makeup bag I have ever owned! Which means… I get to stuff it with even more product without it weighing a tonne! As always i’ve got my Chanel mirror and Hakuhodo lip brush in there, staples. In addition, this time I also have a brow brush, also by Hakuhodo which I use with my Tri Brow palette by Make Up Store. The Make Up Store brow powder is a new addition to my stash. 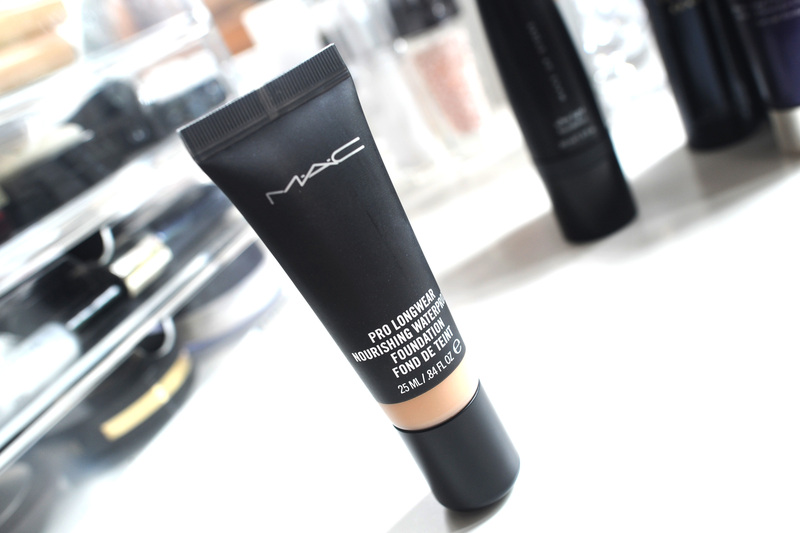 And is great for speedy brows. In the event I don’t have time to whip out my Anastasia Brow Wiz, this is my next best option. On it’s own it doesn’t give me a perfectly defined brow as I do have rather patchy brow hair which also is very fine! But when i’m running late, i’d rather have presentable brows than no brows at all! In the event you do have rather neat groomed brows without too many bald spots and you want some extra definition, a brow powder will be your friend. 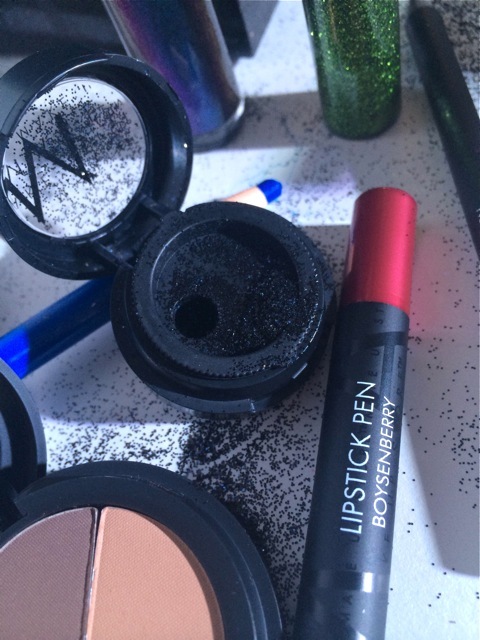 It’s easy to use and gives your brows a very natural finish. On regular days I use my Anastasia Brow Wiz to fill in bald spots and give the ends of my brows a bit more definition by using the darkest shade in my Make Up Store Tri Brow. 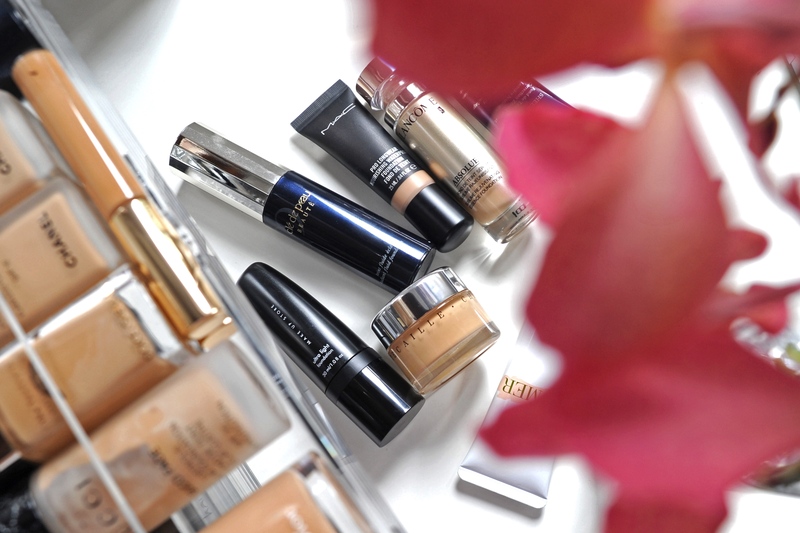 It really defines them well and gives the illusion on a fuller, more youthful brow. 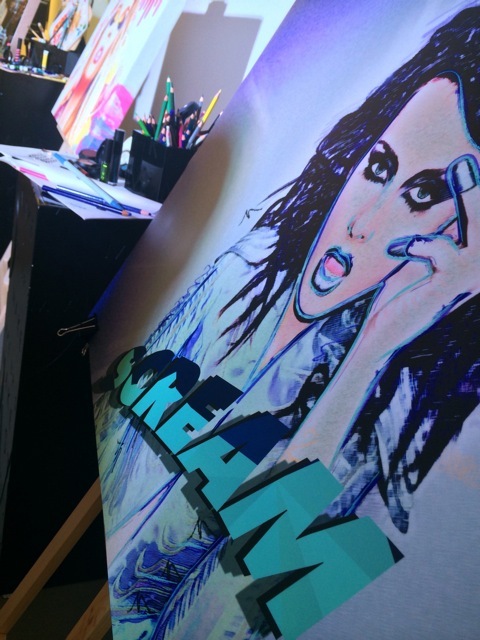 Next up, lips. I haven’t got any lipsticks in there. Mainly cos I don’t wear lipstick while i’m chilling at the beach, unless it’s dinner of course and I whip out a bright orange. The three products I relied on were the Tom Ford Rose Crush Gloss, my very first Tom Ford gloss, Tarte Blissful Lip Surgence lip gloss that came in a Sephora lip kit set, (I never really went out and purchased this) and my holy grail lip balm, the Ettusais Lip Essence. In fact I’m just reapplying it right now. The Tom Ford lip glosses truly are hard to beat. 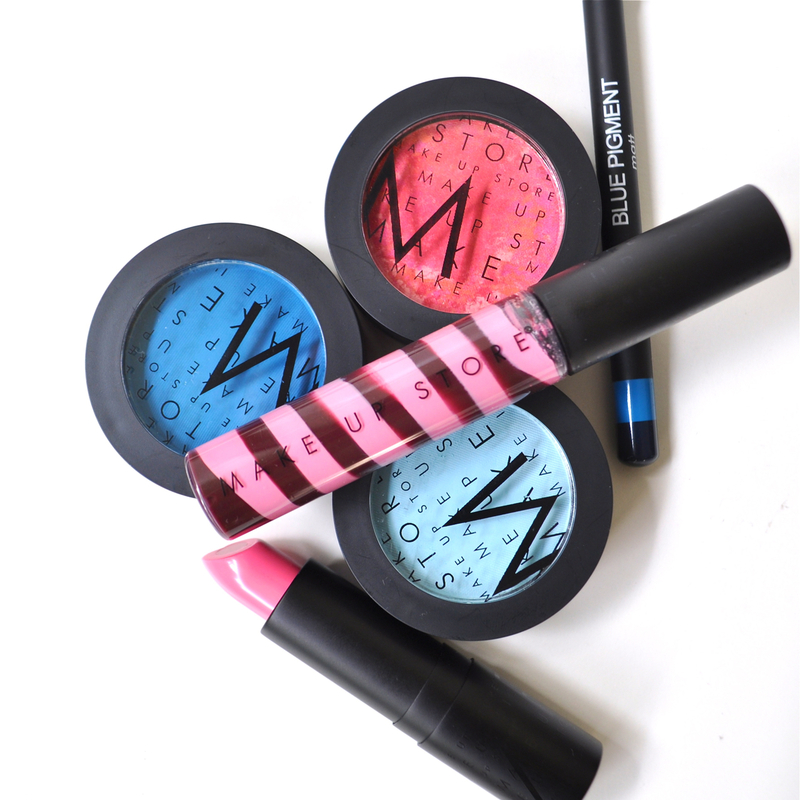 They are non sticky, highly pigmented (as far as lip glosses are concerned) and long lasting. 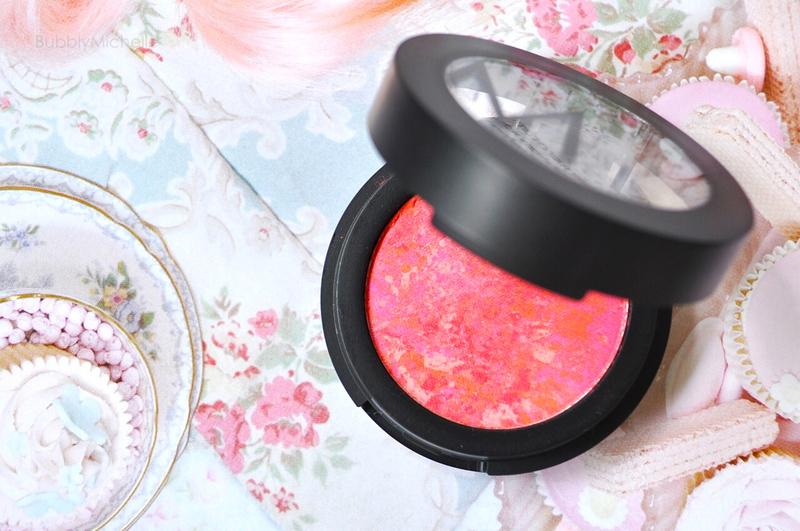 Rose Crush is my most used colour and it goes really well with medium tanned complexions. I highly recommend this. The Tarte Blissful gloss is a sheer peach coral shade. 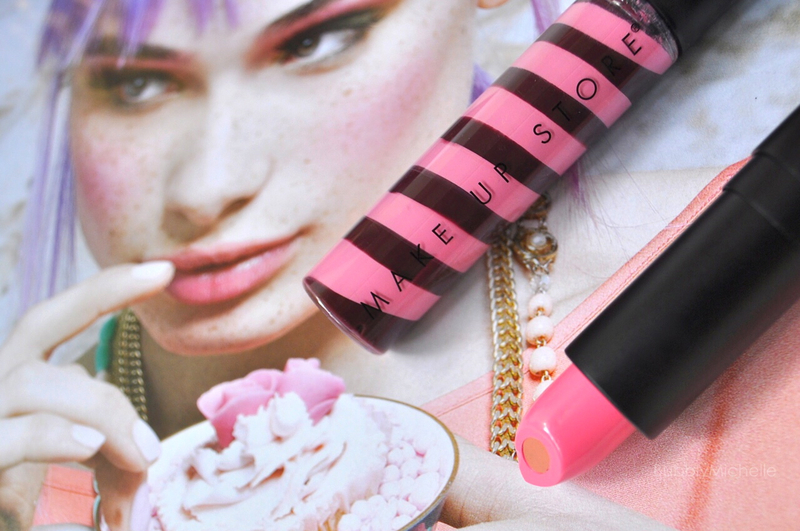 Smells like sugary vanilla and does a good job of keeping the lips hydrated. I enjoyed this gloss, although for some, the smell could end up a bit overpowering. For skincare, I relied on my Crabtree & Evelyn handcream in Caribbean Island Wild Flowers & the Kiehl’s Ultra Light Daily UV Defense SPF 50 PA+++. Truth be told, I packed this C&E handcream for it’s very beach appropriate, fresh smell and pretty packaging with the coral motif. There I said it. However C&E is in fact one of my current favourite hand cream formulations as it’s hydrating, yet non greasy. 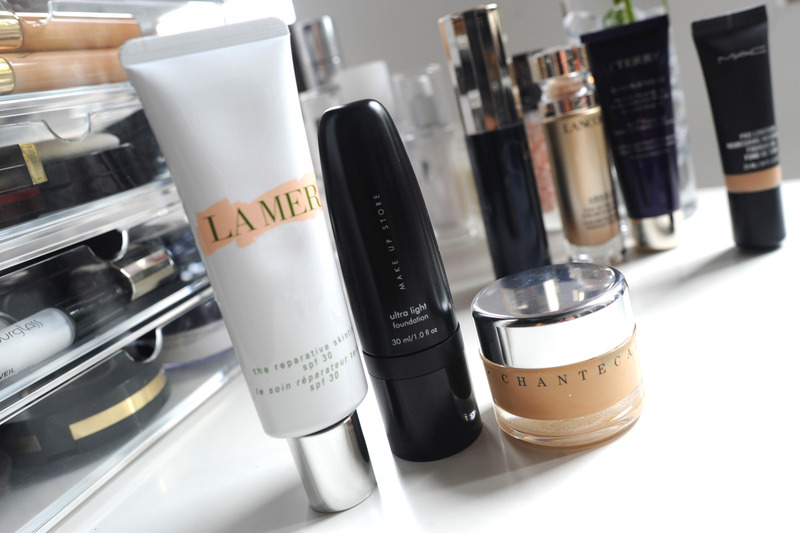 It’s a good medium between my heavy La Mer handcream and other lighter options like the L’Occitane ones. The Kiehls sunscreen on the other hand was as essential. I use this for my arms and chest, hence why I have it in this lager size. 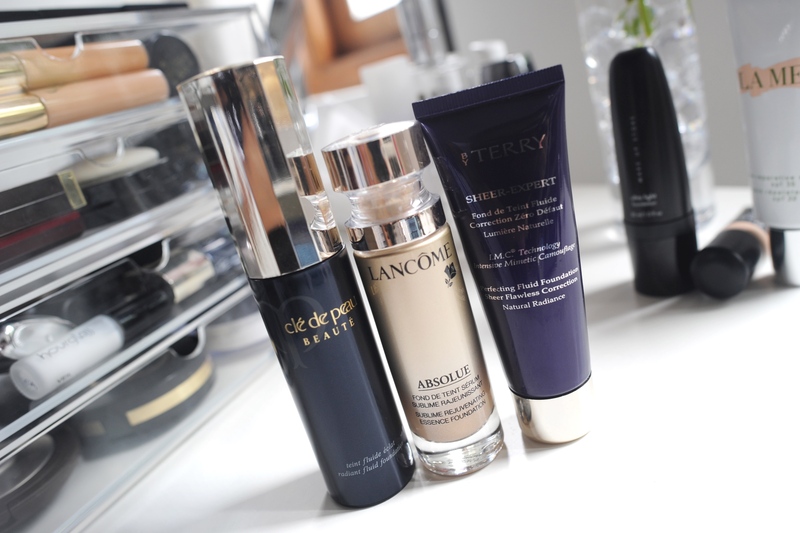 For the face I strictly rely on my Avene one which has SPF 30. 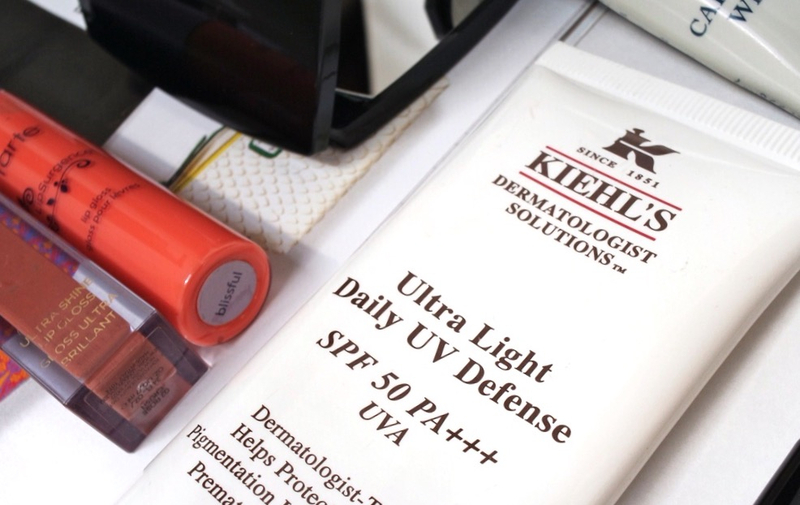 I don’t take that around in my makeup bag as I never reapply my sunscreen on my face. Bad I know. But I do liberally apply the Kiehl’s one on my arms every 2-3 hours or so. It’s a nice light texture and doesn’t have that god awful, typical, old-school sunscreen smell. Next up two perfume samples I carry for touching up. My favourite between the two, Guerlain Aqua Allegoria in Manderine Basilic. I love the fresh zesty fragrance of this and pairs well with humid, sweaty weather. I plan on purchasing the full size when I go back to Singapore next week. The other newer addition was the Giorgio Armani Si Perfume. Something a little too sweet for my liking, but it came in my travel pouch so I let it be there. 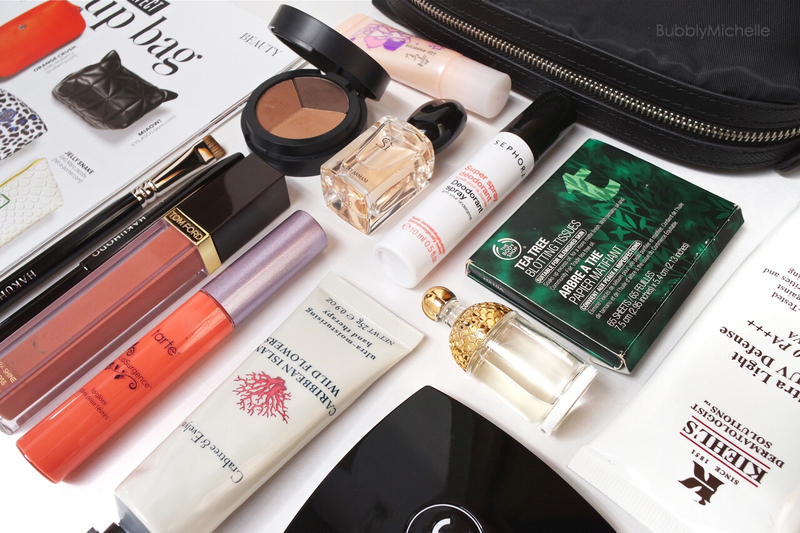 So that concludes my ‘What’s in my bag’ mini post! I hope you found it a useful read and discovered something new. Wishing you a great start to the week AND new year, Michelle. 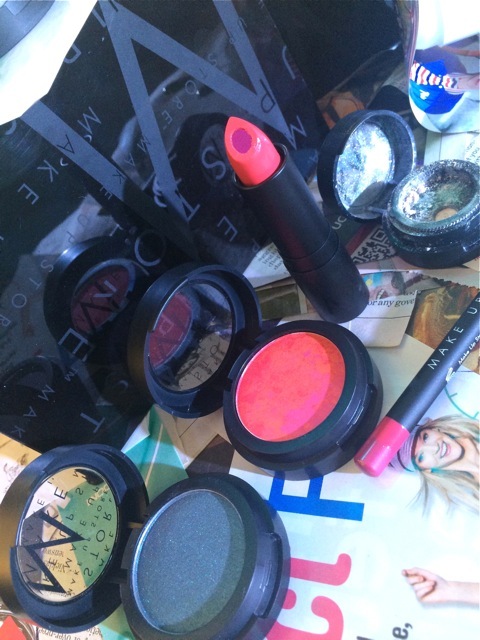 So a couple of weeks back I had the privilege of previewing the Make Up Stores Autumn 2014 collections. As someone who is already familiar with most of it’s products, I can say they do ‘colour’ really well! 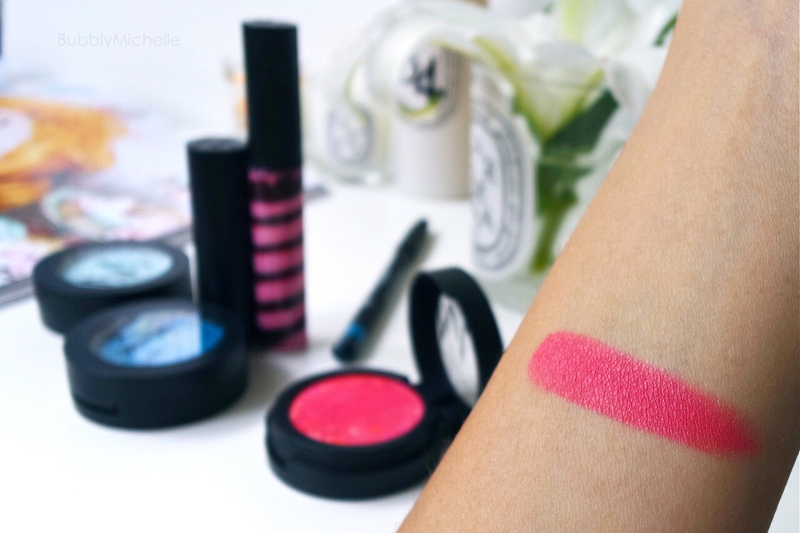 Somewhat of an artistry brand if you may, very similar to the likes of Illamasqua and Nars. 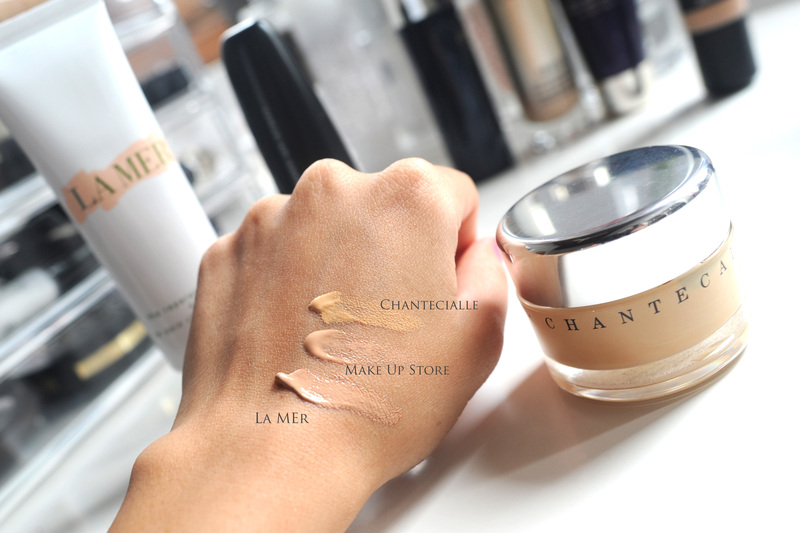 What I love about brands like this is that the formulations are stellar and pretty much consistent unlike high end brands which seem to release random duds. 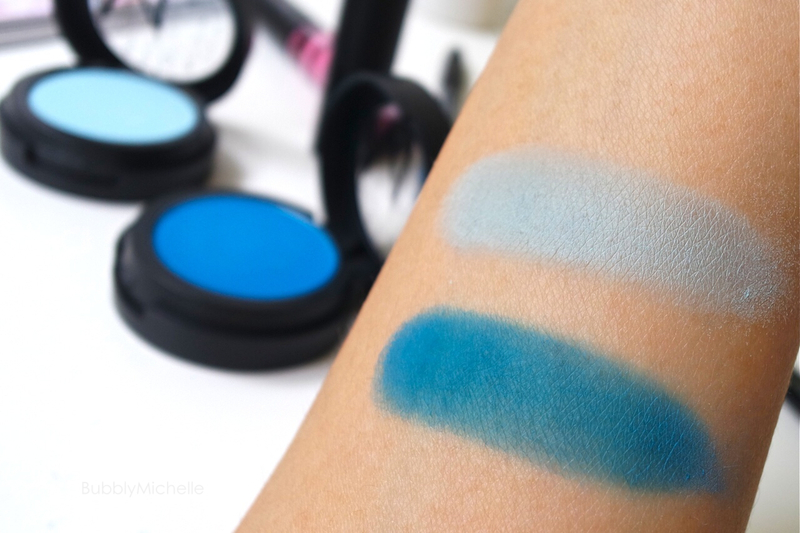 Their shadows are always very pigmented, the blushes apply like a dream, and the eyeliners are some of the best out there in my humble opinion. As you could imagine I was very excited to see tonnes of colour in the new releases. 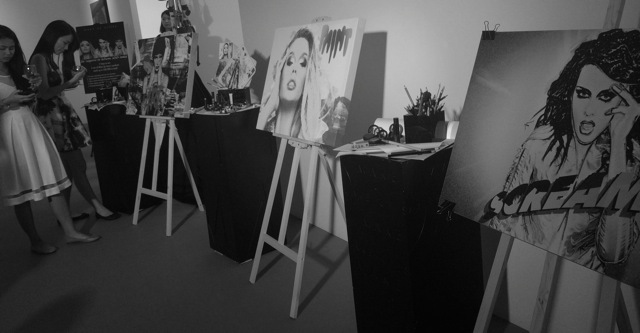 ‘Paint’ which is set to release in August being my favourite. Let me take you through what’s new for Autumn in a collage form ❤ with a few items that caught my eye in each collection. I like that the autumn releases come in little capsule collections each month.. And this time around there’s Paint, Scream, and Art. All very different as far as the palette goes, but gorgeous none the less!! Here’s a look at what’s coming out with the Paint collection releasing in August. 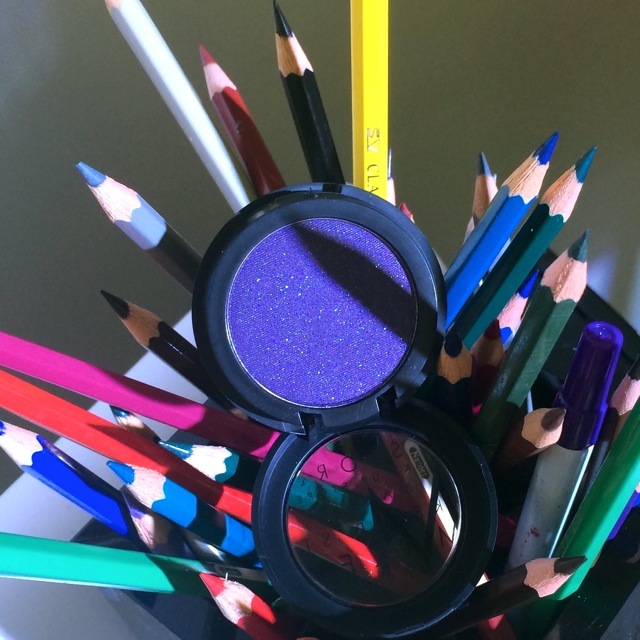 Talk about about a riot of colour! Don’t you love it??!!! As you can see, it consists of two eyeshadows, a gloss, lipstick, pencil liner and a marble blush. There’s also fun little neon nail art embellishments which would be perfect for dressing up a simple manicure. 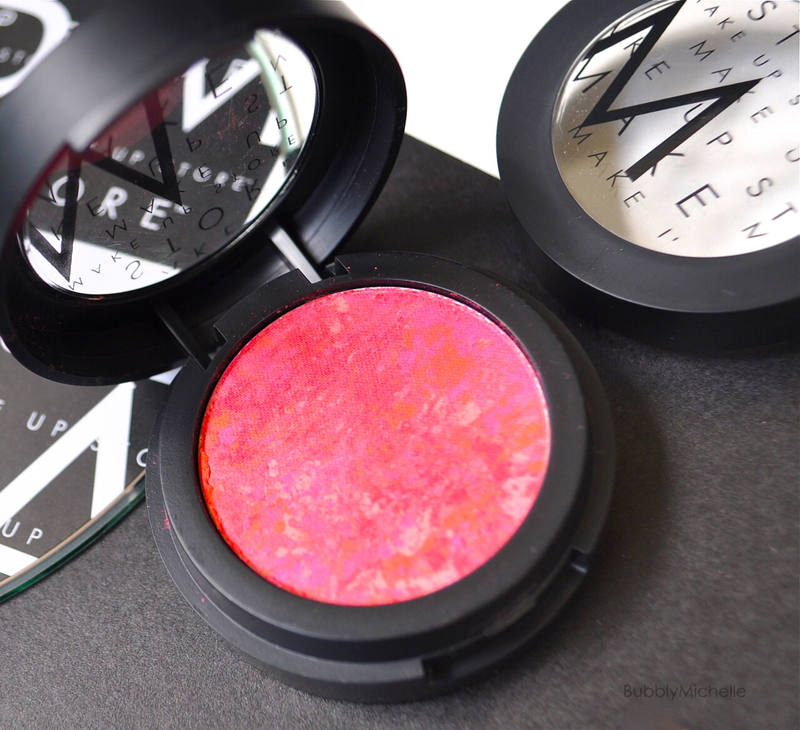 If I had to pick one item, i’d say go for the marble blush Rosso Verona (SGD 32). These are soo pretty and pack some very good colour! 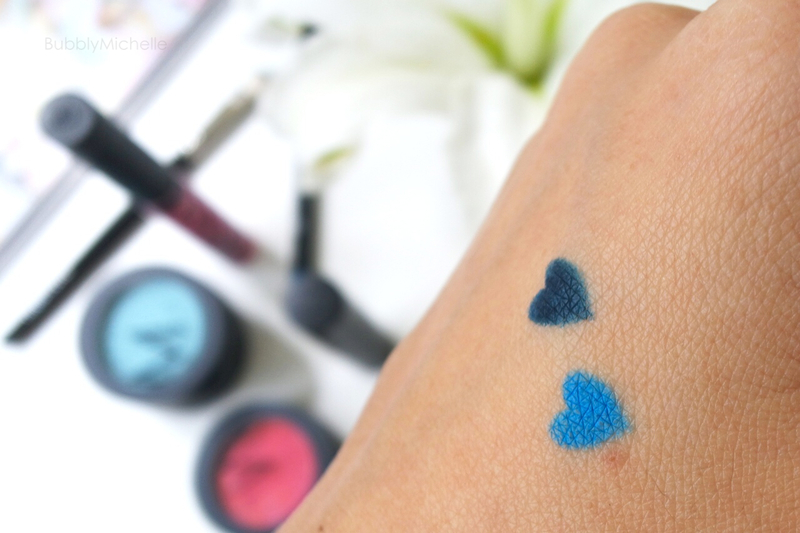 For those with a more adventurous spirit, the two matte shadows (Atelier and Paint retailing at SGD 27) make for very interesting additions to any makeup collection. 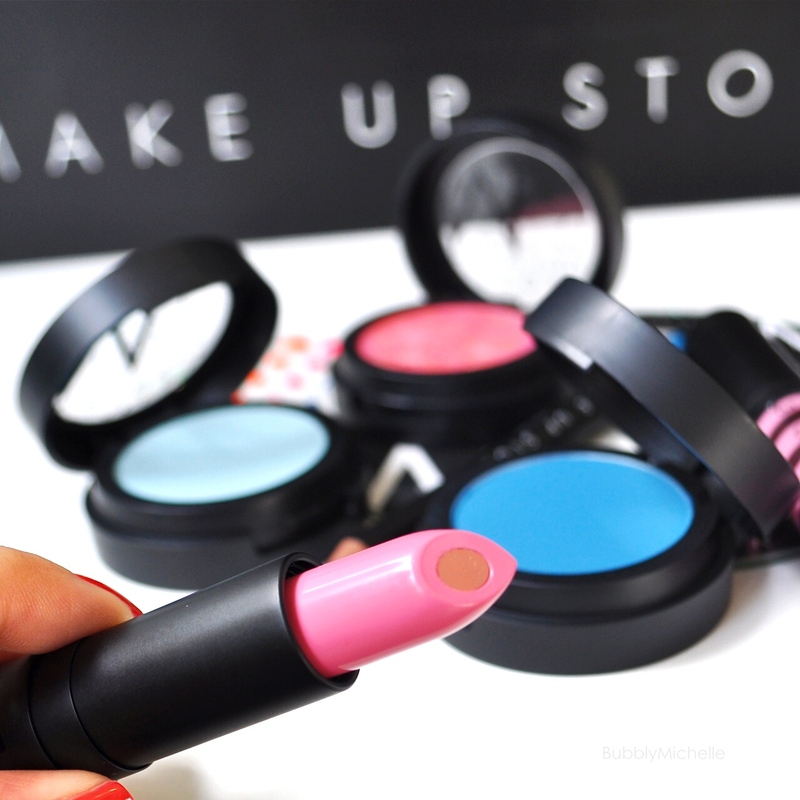 Although the satin finish is my personal favourite, Make Up Store is actually known for their amazing quality matte products, so you can’t go wrong there.. 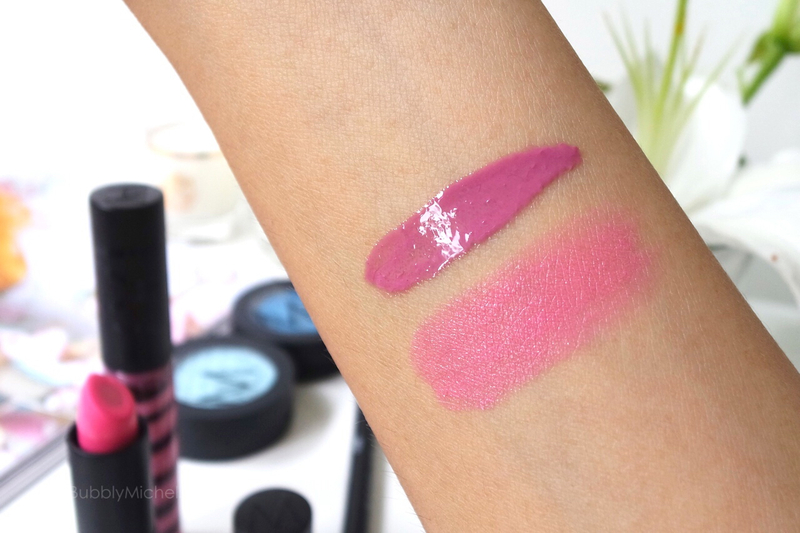 Considering the entire collection, the most unique though was Blue Pigment dual colour eye pencil (SGD 27) and the duo lipstick Graphic (SGD 29) and of course the candy inspired lip gloss in Portrait! (Which make for fabulous gifts btw) . P.S- Portrait is actually more of a flesh toned pink shade on the lips. The burgundy and pink mixes into this interesting colour which is extremely flattering. This retails at SGD 31. 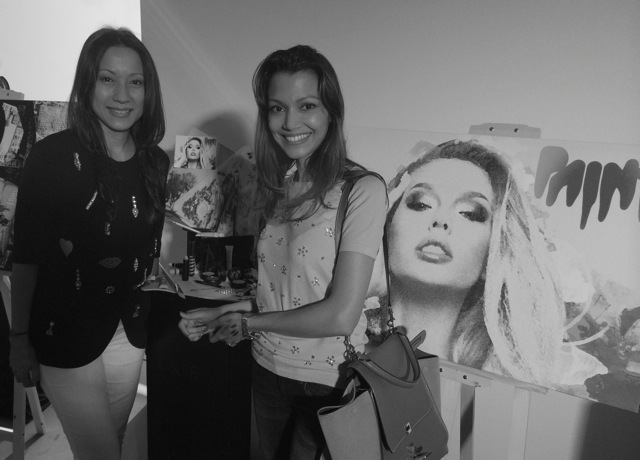 Lastly, your’s truly with the beautiful & ever so stylish Monica Rufina, director of Make Up Store Singapore. 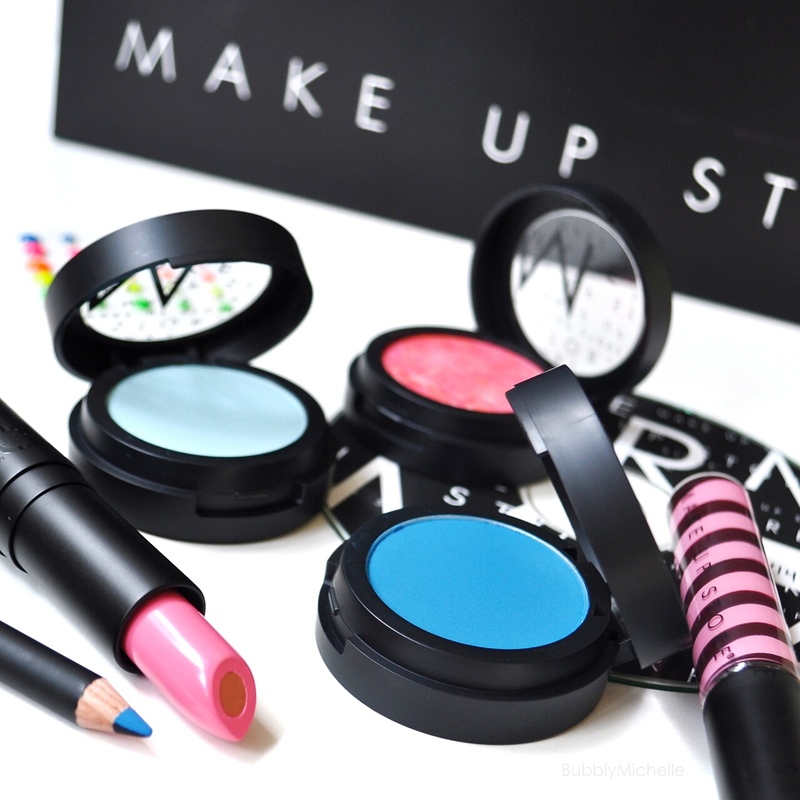 Hope you enjoyed the pic heavy journey through Make Up Store Autumn 2014. 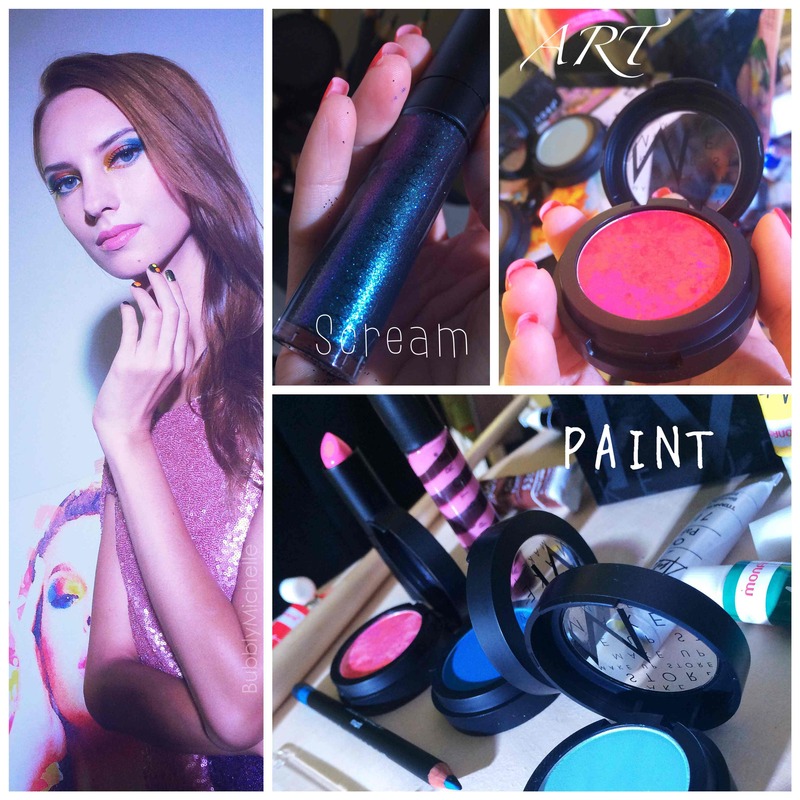 Stay tuned for swatches and a makeup look featuring the products of the Paint collection and Scream collection later on this month. In the mean time let me show you what I’ve packed. This looks like a lot. And yeah maybe it is. But other than those few extra eye palettes, everything else is my day to day makeup. Plus it’s for a slightly longish trip so I needed a few extras to avoid regret! 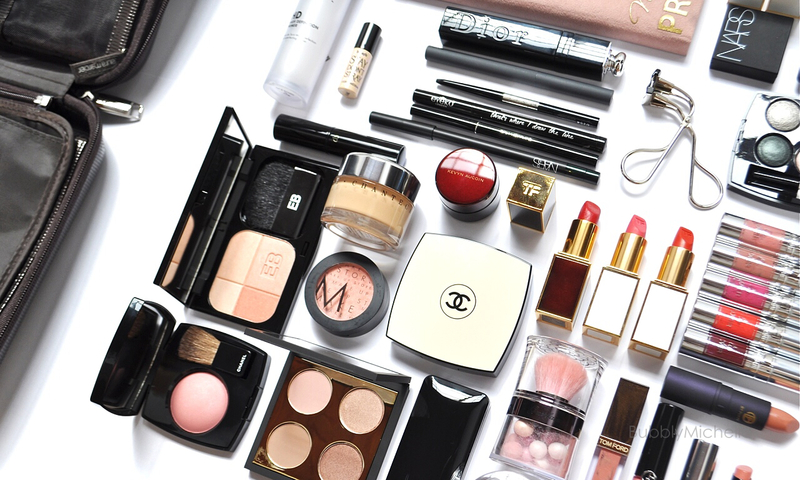 To make sure you don’t miss anything, I suggest you follow a check list or pack things in the sequence you apply your makeup, so you go step by step and don’t forget anything. I have a nasty habit of leaving mascaras and eye primers behind, so I have finally, FINALLY got a checklist ready to make sure I don’t leave things behind in future! 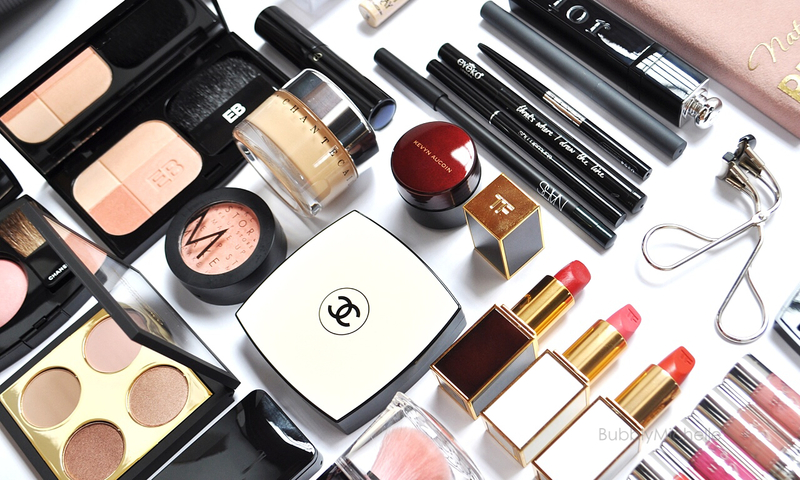 So here’s a list of what would essentially be in my travel makeup bag. So here’s more close ups of what I packed. I used my Laura Mercier Artists portfolio to pack a majority of these. The foundation + Kevyn Aucoin SSE + primer ( I packed in a zip lock bag), lash curlers (in their original box) and the massive It Palette, they all went in my cabin bag safe and sound, tucked between my clothes for extra cushioning. The Guerlain travel Meteorites though I packed in their original box and put it in my hand luggage as it’s packaging is fragile. I don’t want to have to deal with a cracked jar while on vacay! Instant fun spoiler >.< . As you can see I went to town with lip products and eyeshadows, of course this is totally unnecessary and you don’t have to pack that much! In this case the eyeshadows were packed mainly cos I want to test them out for upcoming blog posts, and the extra lipsticks though are simply cos I like having tonnes of choice in the lip department as it’s usually an easy way to tie an outfit together and look well groomed without much effort. 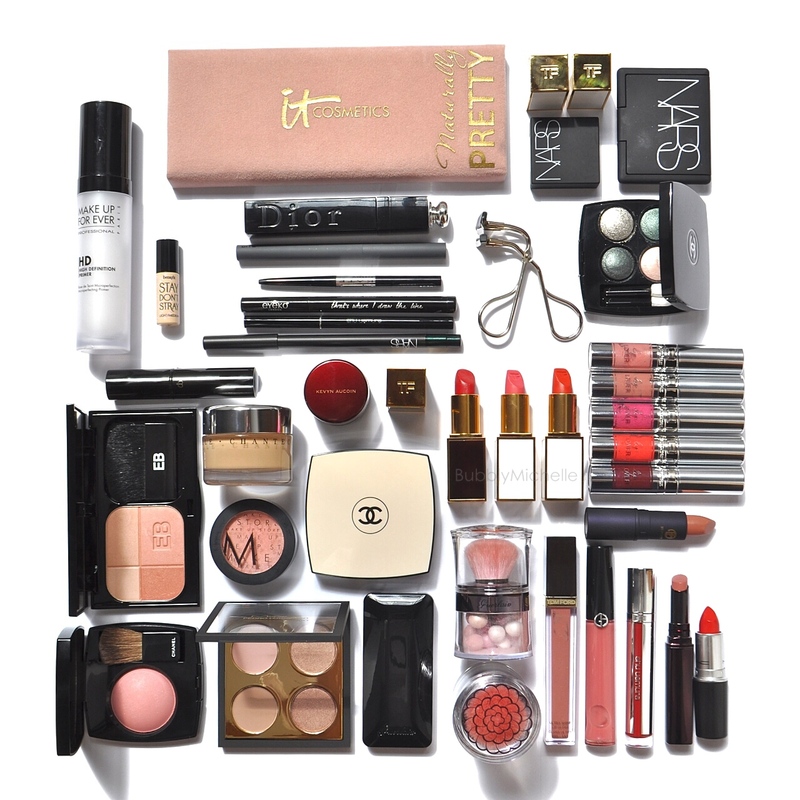 Normally I transfer all of these into a little pouch when I arrive at my destination so that they are in one place for easy access when I put my makeup on. Finally, thank you for dropping by today, I wish you all a wonderful weekend, and don’t forget to enter the Benefit Giveaway thats open to Singapore residents (P.S- make sure you read the giveaway instructions well so that your entry qualifies for the giveaway).